Engineered Air's HRP Series is an energy recovery package specifically designed to reduce the high costs of conditioning ventilation air by recovering a significant portion of the thermal energy from the exhaust air. This is accomplished with Engineered Air's QDT Heat Pipe which has a nominal 60 percent recovery factor. How the Heat Pipe Works? The HRP Series heat pipe is a counterflow air-to-air heat exchanger. While it has the outward appearance of an ordinary plate fin chilled water or steam coil, it differs in one major aspect. Rather than each tube being connected to another by a return bend or header, each individual tube is a heat pipe. Operating independently, the heat pipes act as superconductors of heat. The heat pipe is a tube which has been fabricated with an integral capillary wick structure, evacuated, filled with refrigerant and permanently sealed. Thermal energy applied to either end of the pipe causes the refrigerant liquid at that end to evaporate. The refrigerant vapour then travels to the other end of the pipe where the removal of thermal energy causes the vapour to condense into liquid again, releasing the latent heat of condensation. The condensed liquid then flows back to the evaporator section to be reused, thereby completing the cycle. The heat pipe thus operates in a closed loop evaporation / condensation cycle whih is continuous as long as there is a temperature difference to drive the process. The capillary wick action is provided by the circumferentially grooved inner wall (shown below). This wicking action insures the entire inner surface is wet with refrigerant, therefore maximizing thermal capacity. Although the heat pipes span the width of the unit, a sealed partition separates the two airstreams, thus preventing cross contamination between them. Incoming supply air is passed through one side of the heat pipe and exhaust air is passed through the other side in a counterflow direction. Energy from the hotter air flow is transferred by heat pipes to the other side of the unit where it is captured by the colder air flow. The outside air is therefore either heated or cooled depending on the relative temperatures of the air streams. The capacity of a heat pipe to transfer thermal energy can be regulated by changing the orientation of the pipe relative to horizontal. Lowering the evaporator section (hot air side) of the heat pipe below horizontal increases the heat transfer capacity as gravity assists in returning the condensate flow to the hot air side of the heat pipe. Conversely, raising the evaporator end above horizontal decreases or stops heat transfer capability since the condensate has to flow against gravity. Although industrial process exhaust contains valuable thermal energy, it generally contains contaminants in the form of condensables, corrosives or particulates. These complicate energy recovery efforts. An effective heat exchanger must be able to separate the BTUs from the dirty air. This requires both a versatile heat exchanger design plus the engineering know-how and experience to properly apply it. Engineered Air, with its HRP Series of Packaged Heat Recovery units, offers you both. The HRP Series is an air-to-air heat pipe heat exchanger specifically designed for the complexities of industrial heat recovery. Nothing to wear out, so the HRP Series has an extremely long lifetime with no mechanical maintenance. Sealed partition separates the two airflows preventing contamination of the fresh air by the exhaust. Requires no external power of operation. Specially designed with fewer fins on the dirty process exhaust side than on the clean fresh air side. Industrial HRP Series have flat, continuous plate fins to provide see-thru, clean-thru™ capability. Built-up dirt can easily be flushed during cleaning. A wide range of sizes are available that can be installed singly or as modules to meet the requirements of almost any airflow system. A wide range in the number of rows of heat pipes are available to provide desired recovery performance while still affording minimum cleaning maintenance. Buy only the amount of recovery you need. HRP Series range from 6 to 16 inches deep in the direction of flow which reduces space required, lowers installation costs, provides ease of handling and simplifies cleaning. Constructed of heavy gauge materials to easily withstand the rigors of industrial environments. In short, the Industrial HRP Series has the versatility needed to meet the varied conditions of industrial heat recovery. In addition, Engineered Air has the knowledge and experience to successfully apply this versatility to solve your heat recovery problems. 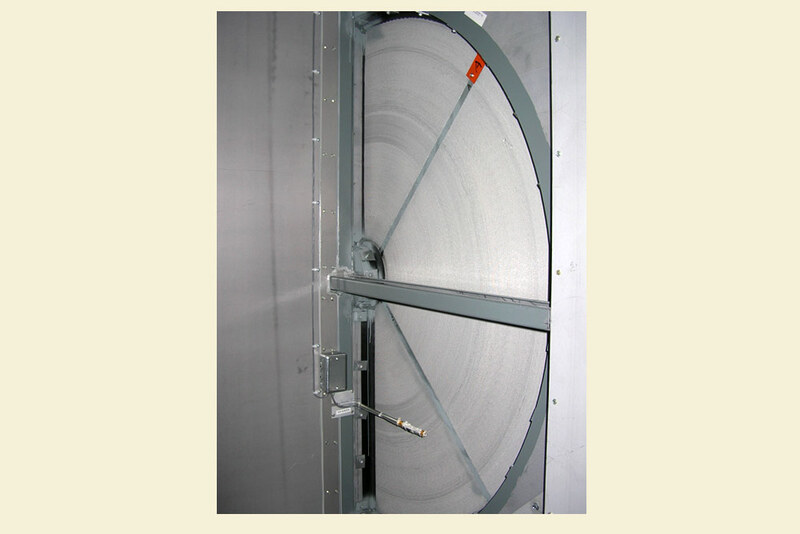 Our custom manufacturing facilities allow us to incorporate HRW Heat Wheels into products such as Indirect-Fired Gas Heating and Mechanical Cooling equipment. What is a Total Energy Wheel? The thermal performance of the wheel, (or, in other terms, the sensible performance) is attained by passing a warm air stream through a semi-circular portion of the rotating wheel, which in turn transfers a large portion of its heat to the honeycombed substrate. As the wheel rotates into the path of a cool air stream, the substrate gives up its heat to that medium, thus warming the cool air. For optimal performance, the two air streams, typically makeup air and exhaust air, pass through the rotary exchanger in a counter flow configuration. For each design wheel, there is a RPM for maximum heat transfer. The wheel can be slowed down if necessary, in order to reduce the rate of transfer. The latent performance of the wheel is attributed to the desiccant coating adhered to the rotor. The desiccant used on Engineered Air total energy wheels is a zeolite, sometimes referred to as a molecular-sieve. Zeolites, both natural and synthetic, have been employed as adsorbents for gas separation for many years. They have been in use in the HVAC industry since the early 1980s as a desiccant to total energy and dehumidification wheels. The zeolite desiccant consists of a multiplicity of pores which absorb and hold molecules. The driving force for adsorption is the vapor pressure differential between the structure of the desiccant particle and the atmosphere around it. Likewise, vapor pressure is also the force for desorption. That effect may be enhanced by heating the air. Figure 2 shows the aluminum substrate on which the desiccant is adhered. Engineered Air employs aluminum for maximum sensible heat transfer and its ability to hold the desiccant coating. The benefit of utilizing zeolite as the desiccant in total energy wheels is attributed to the speed with which it adsorbs and desorbs moisture. Other desiccant such as silica gel have greater moisture holding capacity, but take a much longer time to absorb and desorb moisture. The Engineered Air Total Energy Wheel has the highest sensible efficiency of any of the reclaim products offered by Engineered Air. Total energy reclaim is particularly advantageous in climatic zones where the cooling demand is high ambient humidity. The additional benefit of moisture transfer makes this product a must for any makeup air system, whether it is new or retrofit construction. Engineered Air's HRA Series is an energy recovery package specifically designed to reduce the high costs of conditioning ventilation air by recovering a significant portion of the thermal energy from the exhaust air. 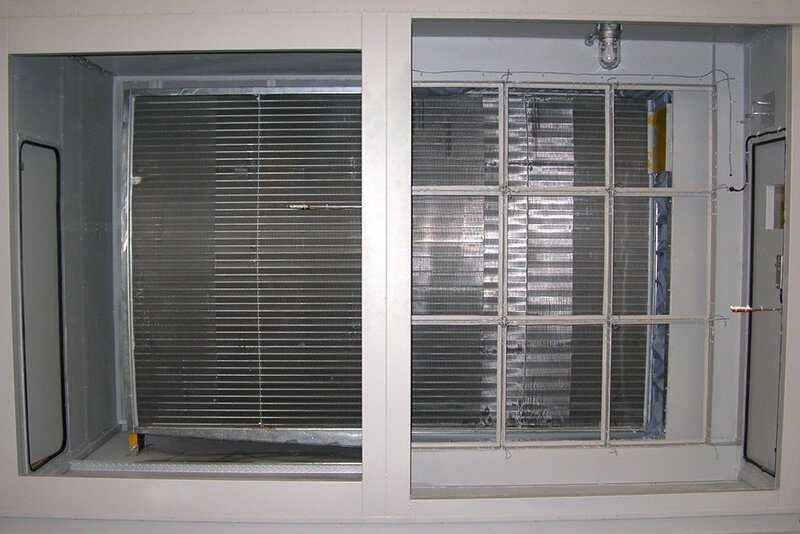 Air to air heat exchangers can be employed in any ventilation system to reduce energy consumption. Systems that see the greatest benefit are the ones that have high volumes of hot exhaust air that also need to preheat cold outside air. What is an Air to Air Heat Exchanger? The TRP heat exchanger is a cross-flow fixed plate heat exchanger. Alternate layers of plates are used to form separate exhaust and supply air stream passages (Figure 1). Sensible heat is transferred from the warm air streams through the separating plates into the cool air streams. Any moisture in the exhaust air stream will increase the heat exchanger's performance. As the entering outside air begins and continues to cool, the exhaust air temperature will reach its dew point temperature. When the exhaust air temperature is at or lower than the dew point, the moisture in the exhaust air will condense on the surface of the plates giving up energy in the form of latent heat and is transferred to the supply air stream. Incoming supply air enters at a right angle to the return air stream (Figure 2). The outside air is either heated or cooled depending on the relative temperatures of the air streams. The Engineered Air TRP heat exchanger is capable of recovering up to 75&percnt; or more of the available energy in the exhaust air stream. This high rate of recovery is due to the heat exchanger having only one heat transfer surface of high quality aluminum between the two air streams. There are no moving parts providing an extremely reliable heat recovery device. Because this is a static device, there is virtually no leakage between air streams. The edges of each plate are folded and sealed with a silicone based sealant. Ribbed, high quality aluminum plates are used providing straight-through air flows minimizing the air pressure drop and thereby minimizing electrical costs of the fans. 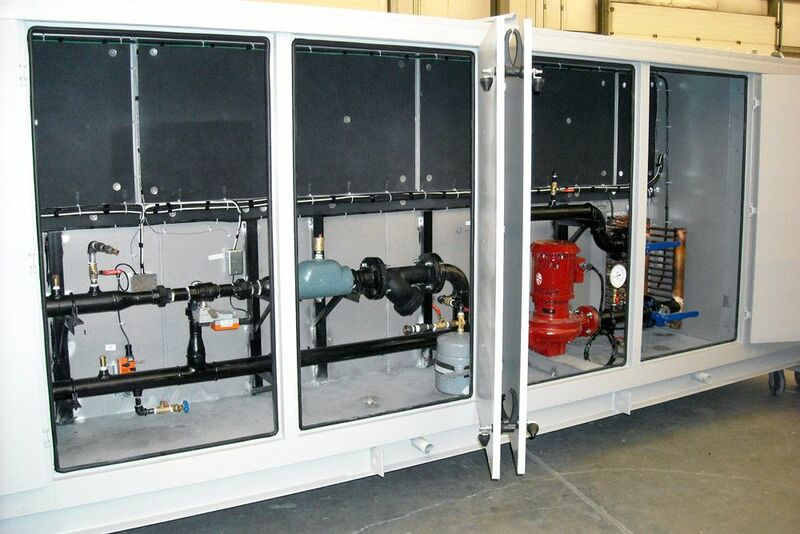 A completely packaged system of HEAT RECLAIM including supply and exhaust blowers, heat transfer coils, filtration, supplemental heating, temperature controls and limits, and roof mounting frames. Utilize the Engineered Air computerized coil selection process to optimize the fluid handling system components for maximum efficiency and minimum cost. Where should HRG Series be used? Commercial and industrial buildings, where exhaust and makeup are required for many hours of the year, the more hours the better. In installations where exhaust air temperatures are from 80°F to 200°F and where the air is not particularly corrosive. Exhaust air temperatures below 80°F tend not to be an economic source of heat, particularly where outdoor air temperatures are sub zero, and the possibility of circulating glycol at temperatures below 32°F exists, thus creating certain frosting conditions on the exhaust coil, which is a dehumidifying coil. While the control system can automatically prevent frost from forming, the efficiency of the system is low while operating in a "frost prevention" mode and energy savings may be less than anticipated. Areas of the country where the normal energy source is relatively expensive will be attractive for heat reclaim systems: the relative cost of energy seems to be rising at an alarming rate throughout all of Canada, so few areas will not find the reclaim of heat a wise economic move. 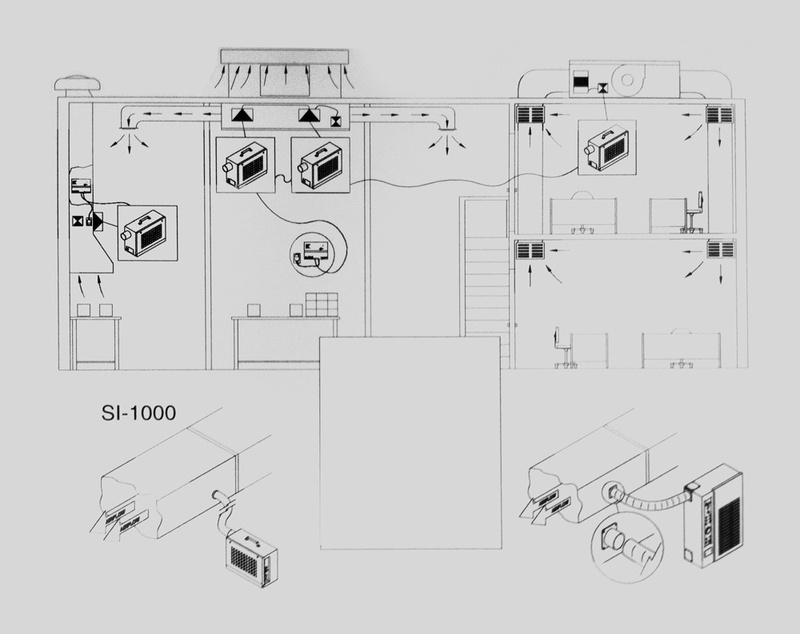 Why a HRG Series System instead of an Air to Air System? The reclaim of heat, as developed so far, while saving heating energy, does demand the expenditure of energy in another form; fan motor horsepower to overcome the reclaim device air pressure drop. A glycol run around system requires about the same amount of extra energy to run the two fans and one pump, than an air to air system does for its two fans. However, in the glycol system, the pump may be shut off at a point when it is determined that heating savings no longer outweigh the cost for pump power. 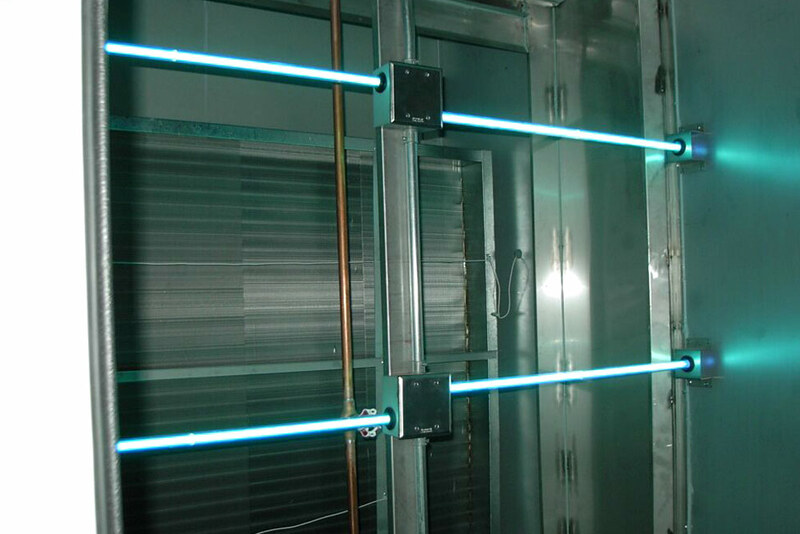 Engineered Air's UV-C Lighting System, UV-Centurion, uses the latest UV-C lighting technology to control surface mold and microbial growth on your Air Handling Unit's (AHU) cooling coil, drain pan and filter bank. 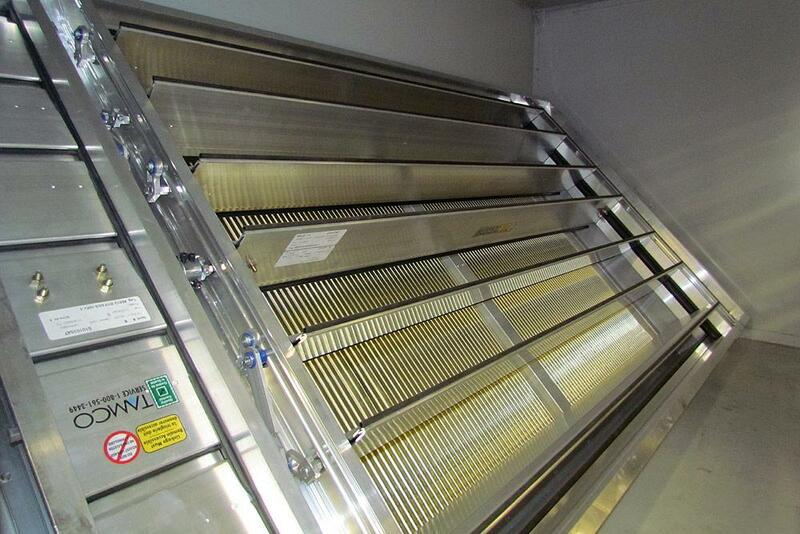 Placement of the UV-Centurion within the AHU is critical to properly irradiate the surface pathogens. Use of this total lighting system ensures the absence of surface growth, providing reduced maintenance costs and continued maximum operational efficiency of the air handling unit. UV-Centurion direct and indirect irradiation design provides proper UV-C ray dispersion to cover the total controlled surface, killing most common molds, bacteria and viruses in under 60 seconds. UV-Centurion triple zone coverage separates the rain pan/lower cooling coil module from the cooling coil / filter module to irradiate the areas where molds, viruses and bacteria are most likely to collect. This combination creates system lethal to pathogens. The drain pan module with reflector , directly and indirectly cover Engineered Air's Fast Pan / drain pan system keeping them clean and free flowing. The coil face / filter module continually bathe the face of the cooling coil killing any pathogens that may be deposited there, keeping them from multiplying and eventually clogging the coil. The downstream side of the filters is also bathed continually in UV-C, killing any growth on the leaving side before it can be released downstream. Impervious to water, controlled operating temperatures. The Grant Bone and Joint Center building was originally a downtown Holiday Inn that over the years had been modified. 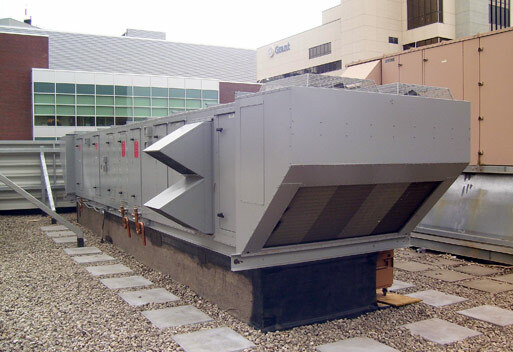 As a former hotel the facility did not have any existing mechanical rooms and space on the roof was already limited with the existing chillers and air handling equipment. Grant Medical Center has been named one of "America's Best Hospitals" by U.S. News & World Report for excellence in orthopedics. Their all-inclusive specialty center features a comprehensive team of physicians committed to providing the most advanced treatment and therapy for everything from fractures to total joint replacement. Grant's experienced total joint replacement surgeons perform more than 1,500 cases a year. Grant Medical Center, a division of Ohio Health, decided to renovate their existing Bone and Joint Rehabilitation facility into a more modern facility with expanded service operating rooms for replacement of joints, bones, and additional orthopedic surgical needs. The Grant Bone and Joint Center building was originally a downtown Holiday Inn that over the years had been modified. As a former hotel the facility did not have any existing mechanical rooms and space on the roof was already limited with the existing chillers and air handling equipment. The downtown location of this building required any additional units to be roof mounted. The new operating rooms required temperatures to be maintain at 60º F (15.6º C) with a 50% constant relative humidity. These conditions were critical because many of the surgeries use unique sutures and glues that are dependent on precise levels of humidity to properly adhere. This, in combination with the surgical garbs worn by the surgical teams also required a lower temperature in the space with a consistent humidity. These conditions from the surgeons played a large role in this design of the new surgical suites. The existing chilled water system did not have enough capacity, or lower water temperature needed to meet the operating rooms air temperature requirements. There was also not enough roof space available to add a new low temperature chiller with an air handler. The cost of the chiller system was found to be more expensive than a packaged DX system. Another alternative proposed was to use a desiccant dehumidification unit but this would have also been cost prohibitive. In addition the consultant specified that when the surgery suites were not being used, the air volume had to be cut in half during “unoccupied mode/non surgery time”. This presented a major hurdle for a low temperature mechanical cooling application to overcome. Working with Engineered Air’s Special Pricing Department, Columbus Sales proposed a dual cool unit design with an Engineered Air model FWA-186/O/MV/UVC. The equipment design was able to satisfy the surgeons comfort requirements. When the dual cool unit operates at 100% air volume during “Surgery Mode” it provides a 45°F/45°F (7.2°C/7.2°C) leaving air temperature utilizing both the first and second DX coils. The equipment also includes optional condenser reheat coil supplying 5°F (9°C) reheat to the dehumidified air temperature as needed. To provide additional zone temperature control the consultant had reheat boxes installed for each surgical suite. When the suites are in the “Non Surgery” mode the airflow is reduced to 50%, and the second DX system switches off only operating the first mechanical DX coil with a 55°F (12.7°C) leaving air temperature. Truly providing two operating systems in one. From this project we have received other multiple requests for this type of system. 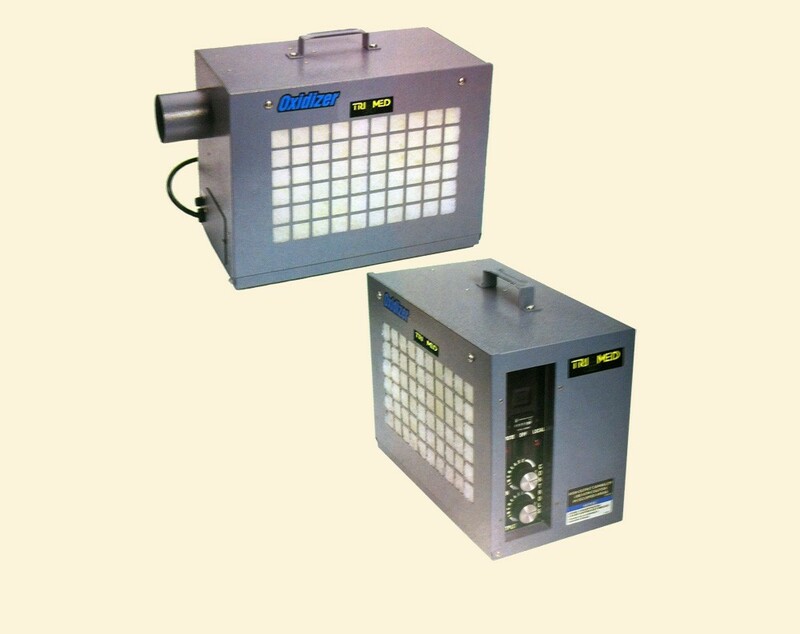 By including an ultra violet light “UV Centurion” system, it has made this a complete package for us to market. It is becoming more of a trend for surgery centers to be built in smaller or existing buildings where owners are unable to put in a low temperature chiller system. Since this project we have had another similar design with the consultant that is currently going out for pre-purchase. The SI Series Oxidizer Units are self-contained air purification products designed to reduce high concentrations of odor & VOCs. They are a very economical solution, using minimal power consumption & requiring no additional chemicals or high priced media for operation and have extremely low maintenance. The Oxidizer process is simple. High static voltage ionizes oxygen and then using basic principles of organic chemistry it naturally breaks down (oxidizes) gaseous compounds, leaving CO2, H2O and O2 as the primary end products. 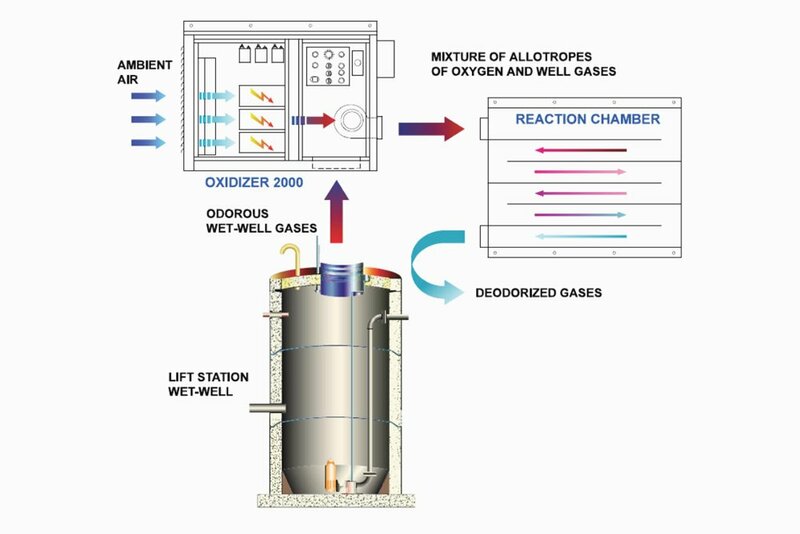 For maximum results, the Oxidizer units should be connected to the suction side of any ducted system to maximize contact time between the oxidant and odorous gases. The Oxidizer units are easily adaptable to the A-TAC1 system to create an automated air purification system, continually balancing oxidant levels with load levels for the air. The Oxidizer will treat air problems in spaces where there are no existing air ducts2 or can be used to inject ozone into ducted air systems. 2 recommended use with A-TAC system if used in occupied space. The SI Series can serve various handlers and can be automated with the A-TAC system for maximum effectiveness. Oxidation technology can be effectively employed to break down odorous gases formed in wastewater facilities or any industrial site that causes problems for those living or working nearby. The oxidation process allows a form of oxygen (ozone) to combine with odorous molecules to break down the chemical structure and reform the atoms into simple compounds. Ozone is found naturally in the outdoors. Ozone is created by ultra violet rays from the sun or by high voltage electrical discharge during lightning storms. EngA’s Oxidizer 2000 copies nature by using high voltage to create a concentrated ozone discharge. 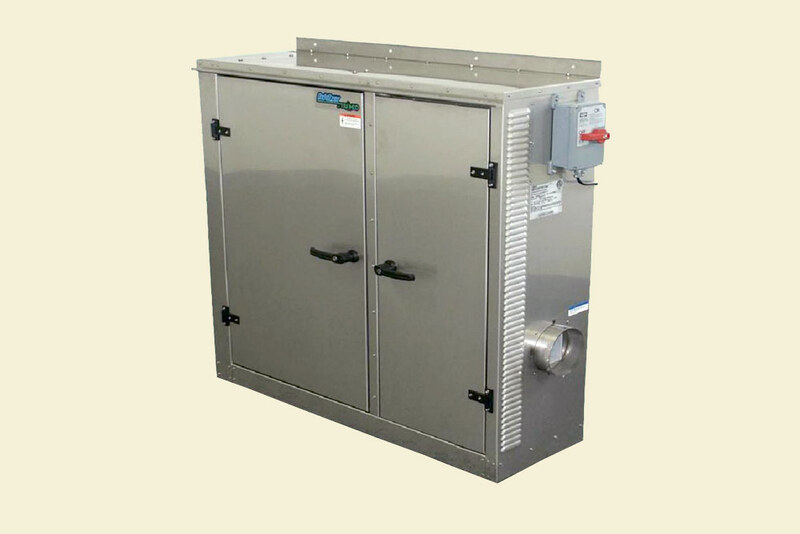 The Oxidizer 2000 produces concentrated ozone within high voltage modules. A powerful fan draws the ozone from the modules combining them with the odorous gas molecules. The mixture of ozone and odorous gases is discharged into a specially designed reaction chamber. Chemical reactions take place that result in a deodorized mixture that is discharged to atmosphere. This patented process is completed with minimal operating cost, no hazardous waste to dispose of and no costly consumables to replace.